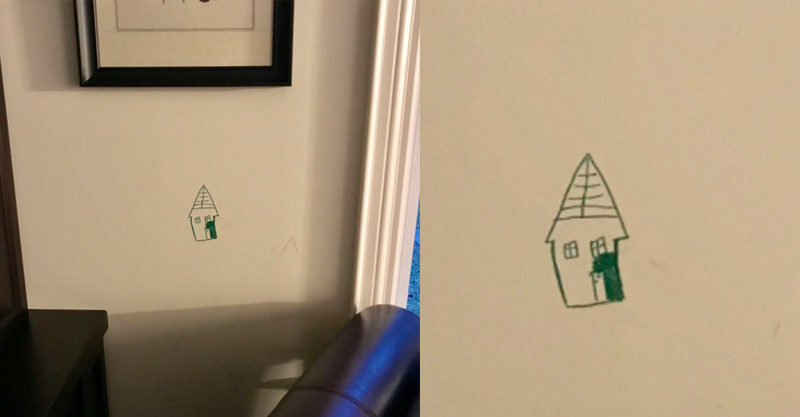 Little kids are notorious for drawing all over the walls and furniture, literally NOTHING is safe. 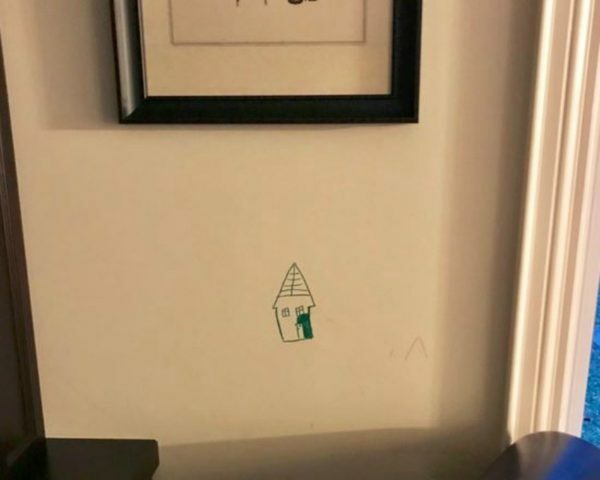 So when one little boy surprised his parents with a lovely wall drawing in permanent marker, they took things to a new level of awesomeness by turning it into a hilarious piece of ‘art’. Canadian neurosurgeon and associate professor, Eric Massicotte, sure has a creative little six-year-old on his hands – although what little kid doesn’t like thinking outside the box when it comes to markers, crayons, paint and all that other crafty arty stuff? Because paper – pfft – that’s way too pedestrian. Nicely painted walls in the eyes of a child are fresh, blank canvas just begging to be drawn on. Which is exactly what Eric’s son did. Well, it looks like this little chap isn’t the only creative one in the family. Instead of going batsh#t crazy like most parents would, while enlisting the help of every stain removal product under the sun before eventually resorting to painting over the whole wall; his mum grabbed those lemons and got busy making lemonade. Eric’s wife framed the piece of art – unfinished colouring and all – and when Daddy came home to his new art gallery/house he loved it so much he shared it on Twitter. “Your kids are going to do things they shouldn’t. It helps if you married someone with a sense of humour,” he posted, alongside pictures of the hilarious artwork. Not content with just framing the wall scribble, Eric’s wife also typed up a genius artist description ‘plaque’ which she then placed alongside the new artwork for all viewers to read. Absolute parenting gold! We’re not the only ones who think this is pure genius – Eric’s tweet has been retweeted over 100,000 times with more than 260,000 likes and hundreds of comments. “In the future when he buys a house, you should definitely return the favor,” wrote one commenter. “Your property value probably doubled considering that it is now both a residential dwelling *and* an art gallery. Hopefully you don’t need to apply for any new permits!” wrote another. “I love this! Someday when parents are old and grey they will wish they could find a little art piece like this,” added another. 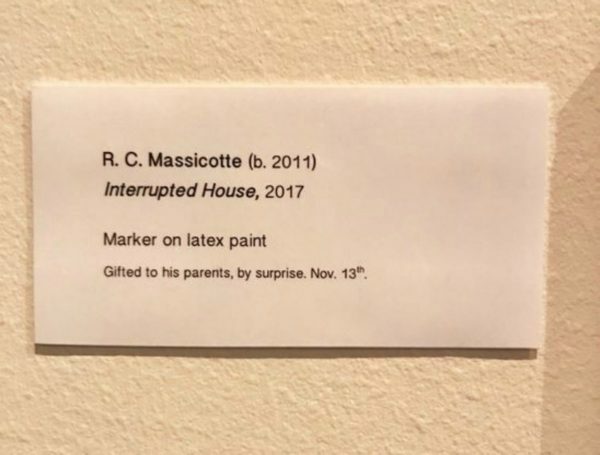 Unfortunately it’s not known whether Eric’s son was punished for his creativity by having his markers confiscated, or has now been whisked off to a fancy art school; either way we think it’s BRILLIANT and reckon all parents should look on the bright side next time their children get up to such sneaky shenanigans. 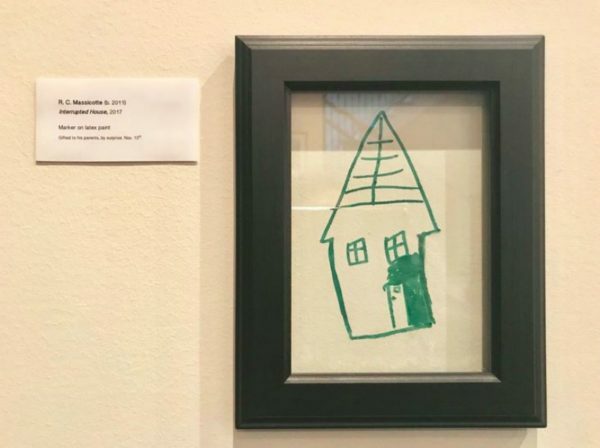 Has your child ever gotten creative with their art around your house?! Post your pics on our Facebook post!